Copyright © 2017 European Pellet Council. The fast development of wood pellets has pushed stove and boiler manufacturers to adapt their equipment to reap the benefit of this fuel. As such, a great deal of technical innovation has occurred, improving installations’ thermal efficiency, grip, reliability and maintenance. Faced with such a great diversity of appliances, it can be sometimes difficult for an individual or a company to find its way. In general, one can differentiate two main types of appliances: wood pellet stoves and wood pellet boilers. A wood pellet stove is a local space heater made for generating heat in the room it is located. In some cases, a hot air circulation system can be installed for heating up several rooms. A wood pellet boiler is made for heating up the water of the central heating system. Pellet boilers can be fully automatised with large capacity storage allowing at least one year of range. There also exists hybrid appliances where a stove, in addition to heating the room it is located, can heat up the hot water system of a house, contributing to or in some cases replacing the central heating system. Wood pellet boilers for central heating exist for every power requirement – ranging from a few kW for low-energy houses to over 1000 kW for larger building, district heating and industrial processes. A typical system includes a fuel storage silo with an auger system that delivers the wood pellets from the silo to the fuel hopper. The wood pellets are fed from the fuel hopper through the fuel feed system into the combustion chamber at a rate determined by the control settings. The combustion fan supplies air to the combustion chamber and the exhaust is ducted to the chimney through a port at the rear of the system. Ash must periodically be removed through the ash pan door. 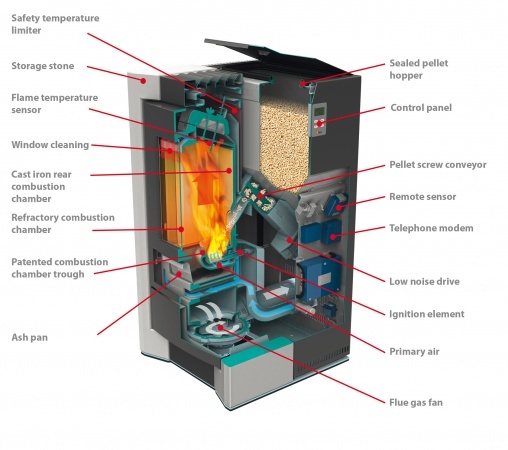 Wood pellet boilers are relatively simple biomass heating systems. Because wood pellets are generally uniform in size, shape, moisture and energy content, fuel handling is very straightforward. Nevertheless, there are some ongoing maintenance requirements for these systems. Except for passive or low energy buildings, wood pellet stoves are used as a substitute heating in addition to a conventional central heating system. Set up in the living room, they offer cost-effective heating, the atmosphere of a flickering fire and optimal operating comfort. The wood pellet stove is filled with bagged pellets, ignites electronically and is operated by a thermostatic control. Wood pellet stoves heat the room directly through heat radiation and convection. The only prerequisite is a suitable chimney. There exists a hybrid device where a stove, in addition to heating the room where it is located, can also heat up the hot water system of the house, contributing or even replacing the central heating system.